Seeking a good bottle of wine in California you’ll normally find yourself on the Central Coast, the valleys north of San Francisco, or the central valley near Lodi. But the folks in Big Bear Village, nestled among Southern California’s pine trees at 6,750 foot altitude, provide a great opportunity to taste some of California’s upcoming wine while enjoying the hospitality, food and music of Big Bear. 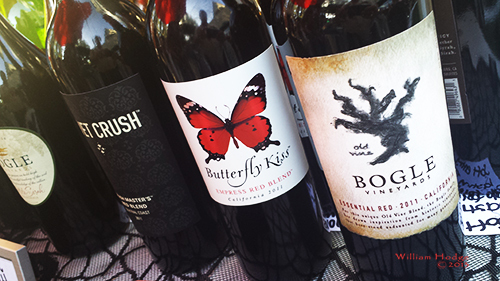 Twice yearly the Village Business Association Of Big Bear Lake hosts their Village Wine Walk. We just finished the summer version, visiting a friend’s cabin with three other couples. A portion of the proceeds ($30pp in advance) benefit the Big Bear Valley Education Trust. Their next Wine Walk is September 20. 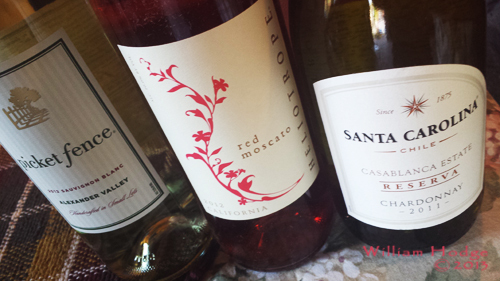 In Big Bear Village, 28 of their retailers share wine and hors d’oeuvres from 3:30 to 7pm. Sprinkled throughout town you find open air venues with live music and of course plenty of things to purchase. This is our second visit, and it was much better as the committee brings in fewer mass-market wines, supplying more and more small California wineries. Of course there is a smattering of wine from Argentina, and even Cucamonga. There were also four wineries on site presenting their vino. Of course, 21 glasses of wine is entirely too much to drink, which is why we sip & spit. Remember we were tasting, not drinking. In the process, we found many interesting wines to put on our list, and some bottles of wine for you to explore as well. We will suggest to the committee several changes that would make the event better. For one, more pour and spit buckets. You cannot take your wine outside of the retail venues (we understand that.) But many of the venues did not have pour buckets or they were not readily visible. You start the day with a glass and 12 tickets for your wine taste, it’s not good practice to drink all that wine. Give folks a place to get rid of wine they may not thoroughly enjoy and avoid over consuming alcohol. Another suggestion we have is cooling the red wine as well as cooling whites. Ambient temperatures in the stores can run close to 80°, which means you’re tasting red wine at ambient temperature. This is about 15° hotter than optimal. It would simply be nice to taste red wine at the right temperature. We know this is a lot of work. But it would showcase the red wines better. We will be back visiting Big Bear Village’s Wine Walk (our last visit was two years ago.) It’s a very nice event, a nice exploration of California wine. This entry was posted in California Wineries - New World Wines, Chardonnay, Merlot, Petit Sirah, Pinot, Southern California, Tasting Room Etiquite, The Pleasures of Tasting Wine, Thoughts About Wine - Exploding Ruby Flowers On Your Palette, Viognier, Zinfandel and tagged bear, big, bottle of wine, california, village.